After that got sorted, he pawned me off (I suspect my craziness eccentricity made him feel a wee bit uncomfortable) on a female Sales Assistant, who was way more eager to help (she did her job with such gusto!) making my experience at Bershka… a much more enjoyable one! I walked away with a stunning Biker Jacket, an insanely cool Biker Waistcoat, and a ridiculously adorable Furry Hooded Jacket! Sure, I plunked down KD 53/800 but you can’t put a price on cool (actually… kinda’ just did, but whatever, just go with it). Also, like I said earlier, I haven’t done much shopping for Winter stuff (justification). Also, everything I got really was just so cool! I think… I’m kinda’ in love with Bershka now! This magnificent Biker Jacket is what caught my attention and actually drew me in to the store. Isn’t she a beauty? 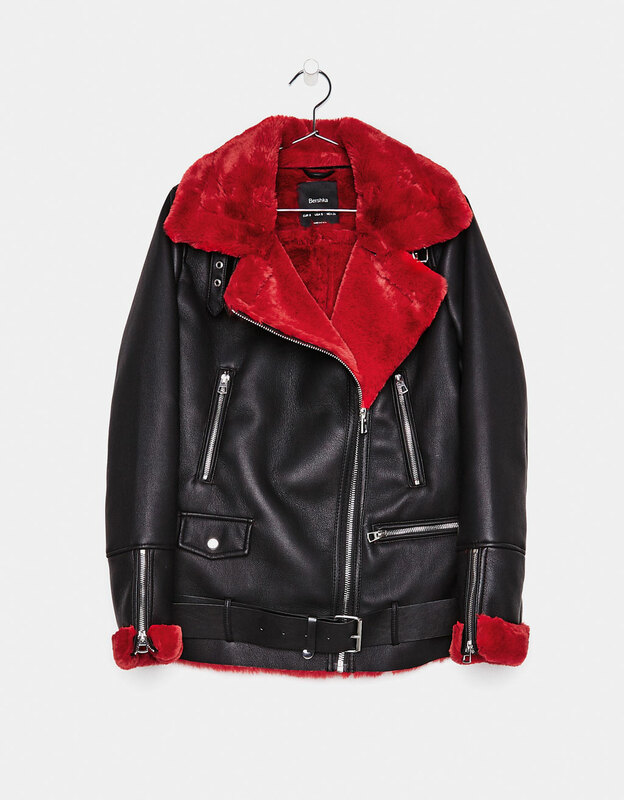 I got the one with Red Fur (as shown) in a size Small (Medium was too long and bulky on me) but the Biker Jacket was also available in Yellow Fur. I kinda’ wanted to get them both, but I knew I wouldn’t get much wear out of the one with Yellow Fur, at least not in Kuwait. Honestly, even the Red Fur is kinda’ pushing it, but I don’t care, because I love this thing! 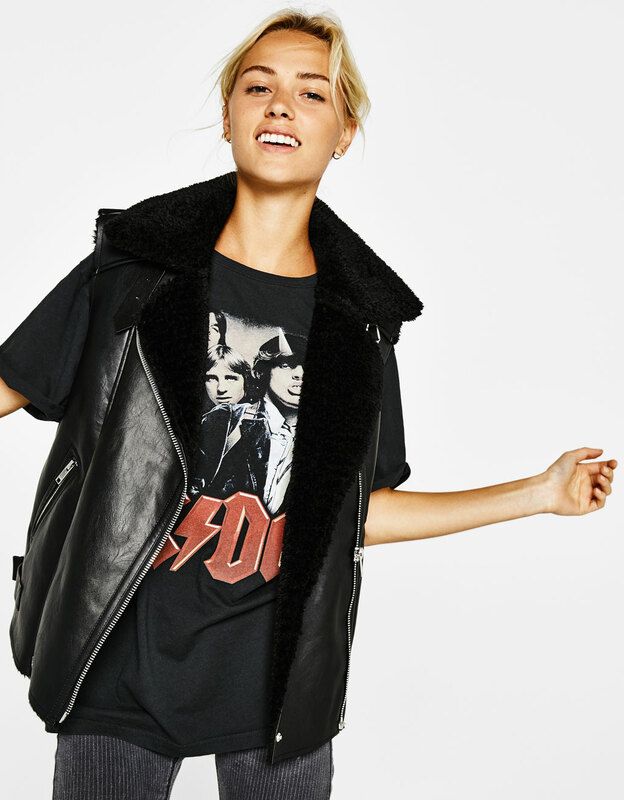 First of all, it’s a Leather Jacket, which in an of itself is the epitome of cool! Second of all, it’s a Motorcycle Jacket with all the accompanying bells and whistles! It’s all buckles and clasps and zippers and diagonal zipped pockets too! You all know how much I just love that stuff! It’s even got a little grommet detailing going on, near the lapel. Third, it’s got Faux Fur which is so cool! There’s just something about Faux Fur on collars or lapels that I find incredibly appealing. It’s something I can easily imagine an androgynous Music God (possibly British) would wear during a concert while belting out a power ballad to a sold-out crowd. Even cooler is the fact that the Faux Fur is actually Red! Now that is straight out of any given Anime! Not only does the Red Faux Fur add a pop of color to the Black Jacket but it’s also a contrasting pop of color, which just makes the Red and Black look even cooler against each other! Also, the Red Faux Fur is not only prominently displayed on the collar, but it’s also on the sleeves too! It doesn’t end there because the insides of the Jacket is actually lined with Red Faux Fur as well! I’m not talking little accents here and there, or a patchy little trim. I’m talking generously thick, fully lined Red Faux Fur on the inside, enough to keep you all warm and toasty during Winter. 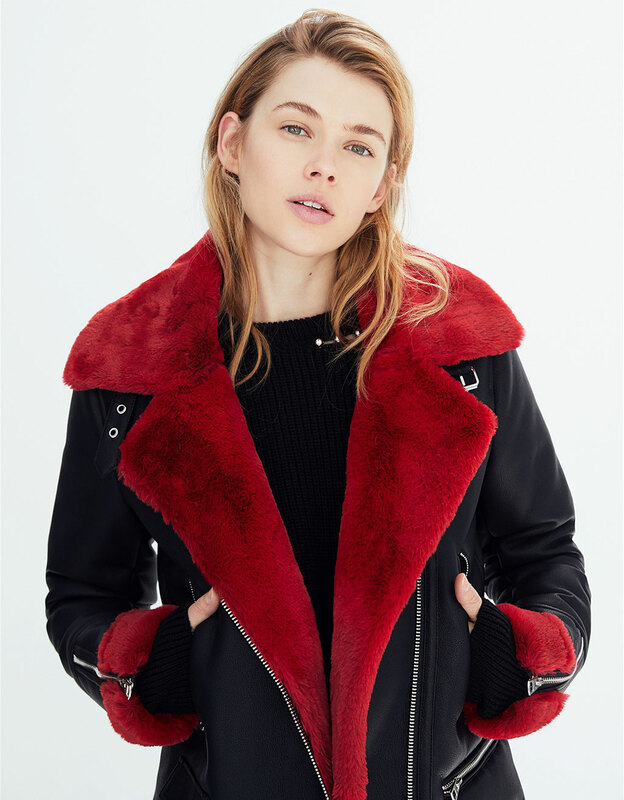 The Red Faux Fur doesn’t just look great, but feels great too (lapel, sleeves, insides, everywhere) as it’s all soft and lovely! Best of all, in my humble opinion, is the low-slung belt! It just makes me feel like I’m channeling Negan (The Walking Dead)! I love this Faux Shearling Jacket! I just really, really love this thing! That said, I’ve only worn this beauty once, so far. I was invited to Faris Villas (Khiran Resort Area) for Liberation Day (February 25th) when I decided to wear the Bershka Faux Shearling Biker Jacket paired with my Black Wedge Sneakers (review to come), Forever21 Olive Skinny Jeans (hauled here) and Promod Red Cable-Knit Jumper (hauled here). Not my smartest idea ever (to wear it on that specific day), what with all the kids in the country celebrating Liberation Day by bombarding each other with Water Balloons and Squirting each other with Water Guns (and anything else that can hold water, for that matter). The stunning Jacket did keep me warm at night, especially sea-side where it was the coldest. However, that was the only time I ever wore this thing, due to the fact that I’d been favoring chunkier knit-wear in 2017 and also because before I knew it, Winter was over (practically flew by)! There’s always next year though! I was about to head towards the cash register to purchase my gorgeous Biker Jacket, when I spotted this beauty! 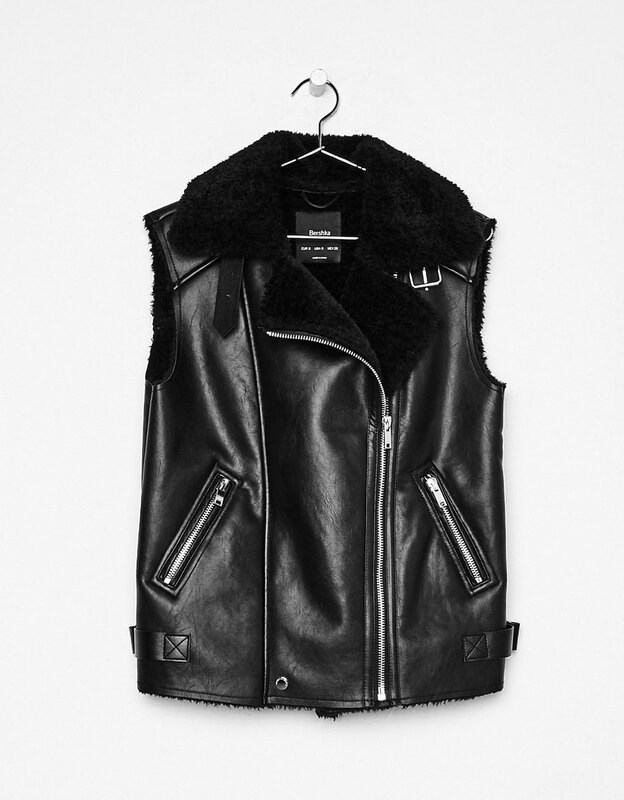 The Faux Shearling Biker Waistcoat was available in Black (as shown) and Beige. I hummed and hawed over getting it, because the Faux Shearling Biker Waistcoast seemed too similar in style to the Faux Shearling Biker Jacket. It was also all buckles and clasps and adjustable straps and zipped diagonal pockets, which as we’ve already established, I find very, very cool! Plus, it was also fully lined on the inside, except where the Jacket was all soft and fluffy, the Waistcoast was all soft and downy and also thicker, kinda’ like genuine shearling actually (you can sorta’ tell in the close-up photo, where the model has the collar popped up). The helpful Sales Assistant was egging me on (as if I needed any encouragement lawl) so I dutifully tried it on, thinking she was just trying to pay her bills, but then quickly felt remorse over that thought, as soon as she pointed out that the Medium didn’t suit me (too long and bulky) and that I should go for the Small instead. I felt even guiltier when she got out some tape (in lieu of a Lint Roller) and without any prompting from me, proceeded to remove the little fluffs of Faux Shearling that were now dotted all over my Beige Top, after taking the Waistcoat off. Despite its shedding issues (nothing a good wash can’t fix… hopefully), I was quite smitten with the Waistcoast, very much so, in fact! I’ve got a thing for Waistcoasts in general, because they’ve just got this whole Menswear-inspired thing going for them, but this particular Biker Waistcoast gave me strong Daryl vibes (The Walking Dead)! That said, I love most motorcycle-inspired fashion (moto-jackets, motorcycle boots, even those really cool skull half-masks – that cover your mouth and nose – that the young bikers have been sporting over here, for a minute)! I might as well just go ahead and get a Hayabusa and get it over with! I was just about to head to the cash register, again, when the Sales Assistant pulled out the most darling Faux Fur Jacket! After I’d turned down almost everything she’d shown me earlier (Appliques and Bows and Ruffles and Floral Print, yuck!) and we had a little talk, I feel like she finally got a really good feel for my sense of style… because I was instantly smitten with the Faux Fur Jacket! First of all, it looked so stinkin’ cute! 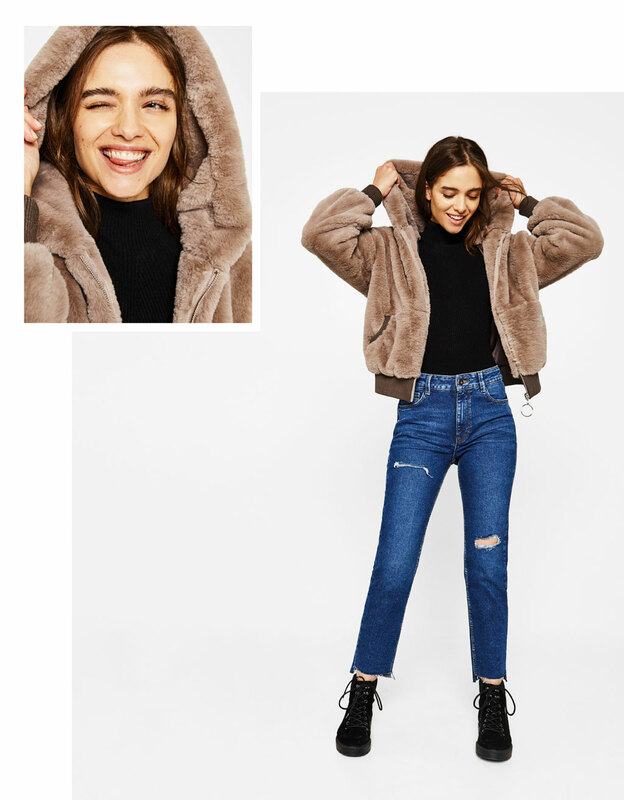 Plus, teddy coats were having a moment in fashion, and this adorable Faux Fur Jacket fit right in! Honestly, it was also the softest thing ever (even softer than the Zara Chenille Sweaters and the Promod Cable-Knit Jumpers, both of which just didn’t even compare)! Second, it had an extra spacious hood (so cool)! Honestly, I’d pop any hood over my head and immediately feel like I was channeling Altair (Assasin’s Creed). I’ve always found Hoods to be so cool, but extra-spacious Hoods are infinitely cooler! 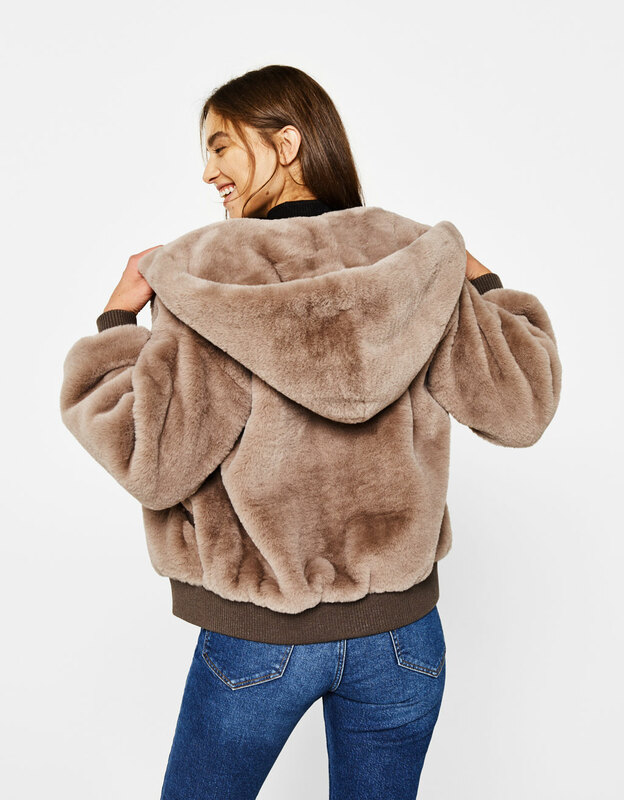 Best of all, aside from the zipper, elasticated waistband, elasticated sleeves, and front pockets, the Faux Fur Jacket was pretty plain (nothing to break up the silhouette or distract from the over all cuteness)! I wouldn’t have hesitated in dropping it like a hot potato, if it’d had a random applique on one side of the chest area (so unnecessary) or a ruffled waistband (that honestly flatters nobody) or something equally stupid. 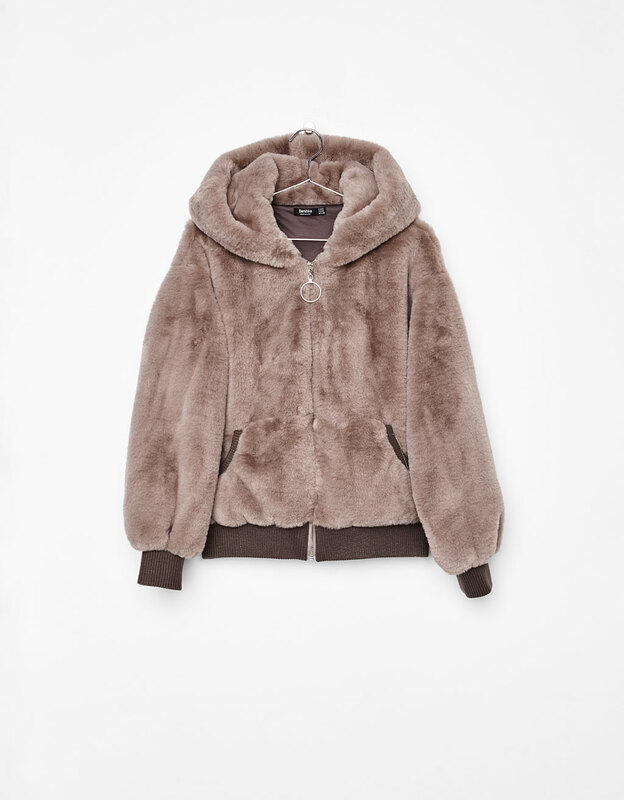 The Faux Fur Jacket was available in Grey (Taupe? ), Navy (Purple?) and Pink. I went straight for the Taupe-y one and tried it on in a size Small (since I’d gotten the other two in a size Small) but as luck would have it, the Faux Fur Jacket turned out to be too short! That’s a first for me… and in a Spanish Clothing Store (literally, caters to giants) no less! It was actually meant to look… not quite cropped, but still somewhat short. I didn’t feel comfortable enough with that (felt like I’d always be pulling it down to cover my rear) so I went a size up and tried it on in a Medium which was perfect, for me! Bershka was literally mid-process of being closed up for the night (the shutters were half-way down and everything) so I had to quickly pay for my stuff and bounce, which I did, after thanking the lovely Sales Assistant profusely. That said, I really couldn’t stop thinking about the Navy (looks purple to me but whatevs) except I knew I’d never get any wear out of it (too young and colorful) out and about in Kuwait. Overall, I’m equally obsessed with all 3 pieces and I’m kinda’ in love with Bershka now!